In 2006, I joined a global movement to hold fan-run charity screenings of Joss Whedon’s sci-fi movie SERENITY to benefit Equality Now. At the time, I had no idea if I’d sell a single ticket or if anyone would dress up for the costume contest. I was willing to pay the $300 or so in fees and sit in an almost-empty theater and watch the movie with my friends and family, if that’s how it went. But, as the saying goes, “If you build it, they will come.” The Browncoats didn’t let me down. With nothing but word of mouth, the little 200-seat Raleigh shindig sold out a few days in advance. And we did have quite a costume contest, with 1st, 2nd, 3rd and honorable mention awards. 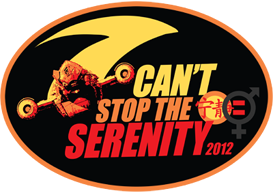 I coordinated another “Can’t Stop the Serenity” screening the next year, then another in 2008. 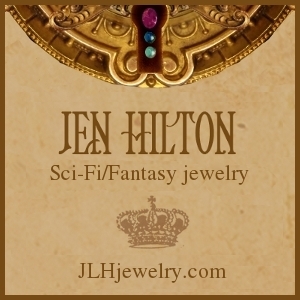 I stepped down as coordinator in 2009, and was instead a global sponsor in my artistic incarnation JLHjewelry. 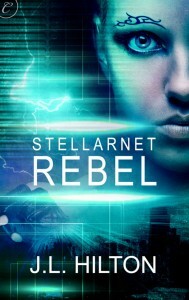 (That was also the year I began writing Stellarnet Rebel.) In 2010 and 2011, I was on the local event committee. 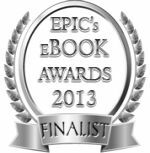 Since 2006, Raleigh-NC screenings have raised more than $21,500.00 for Equality Now and $2,800.00 for Kids Need to Read. Worldwide, CSTS events have raised more than $600,000 for charity. This year, I will again be a global sponsor. 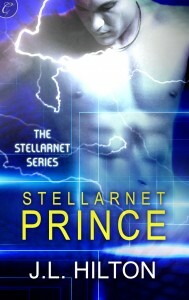 But instead of designing and donating 60 pairs of handmade Browncoat earrings, my publisher Carina Press and I are donating 60 prize bags with free downloads of Stellarnet Rebel, stickers, autographed cards, and nagyx necklaces based on the Glinnish “soul stones” in the novel. I never imagined in my wildest dreams, when I coordinated the first screening in my city, that I would someday have a sci-fi novel of my own and be featured on the same global sponsorship page with Joss Whedon. It’s pretty amazing. This entry was posted in Conventions & events, News, Science Fiction, Stellarnet Rebel, Stellarnet Series and tagged Browncoats, CSTS, Firefly, Joss Whedon, Serenity. Bookmark the permalink.